Our stories are stronger for including all of the elements. Yet given my mention of backstory, it’s probably obvious that we can overdo those elements as well. Information dumps can happen with any aspect of our story. Backstory has a bad reputation from getting cozy with too many info dumps, but it’s not alone. Too much dialogue in a row can lead to “talking head syndrome,” where readers lose track of the environment around the characters. We’ve recently talked about finding the right balance for settings and descriptions. Too big of a chunk of internal thought can feel like “navel gazing.” Etc., etc. On the other hand, if we don’t include any backstory, our characters might lack context for their motivations. Backstory—what they’ve experienced and learned (for good or ill) about the world—is often the driving force behind why they do what they do. In the same way, our stories need the other elements too. They’re all important for creating the tapestry of our story. Why Is It Important to Avoid Info Dumps? 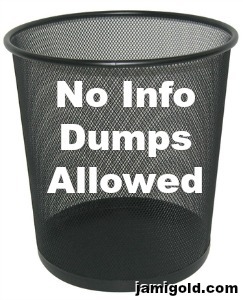 Information dumps are when we tell readers things we think they need to know, but we’re not sharing the information as part of the story. In other words, an info dump is like pressing pause on the story to give more information. How Can We Share Info and Keep Up the Pace? Stories are information, so we obviously need to share it with readers. *smile* But how can we prevent the story from losing momentum while we share it? I’ve spoken before about making sure the information we’re sharing with the reader is relevant. Just because we discovered a cool thing during our research doesn’t mean it should be included in our story. I typically include only about 5% of what I discover during research. Pages of research might result in only one sentence. We should only include information that’s actually needed by readers. Relevant can also refer to the timing of sharing information. Although it might be relevant to let readers know that the protagonist had a rough history with her father, she wouldn’t necessarily think about that fact while rock climbing on page one. Instead, we should save that backstory information until it’s relevant to what’s currently going on in the story, such as when she checks her voice mail after her workout and finds a message from him. Both of the previous tips have to do with being judicious with our use of the pause button, but we can also eliminate the button sometimes. As I talked about with that info dump post above, we can show information instead of telling readers about it. Showing tends to include more action, so the pause is less noticeable. Showing in a deep point of view also keeps the information in the character’s voice, which makes the insertion less noticeable as well. Another way to make the pause less noticeable is to weave the information with our storytelling. That means that we mix the information with other elements of our story so that any information shared isn’t in a big chunk. Usually when we talk about weaving different elements together, we focus on smaller chunks, but I want to start here—at the scene level—to give a complete picture. Our scenes need to have more than one reason to exist. If they have just one purpose, they’re not working hard enough to justify themselves, and they might, in fact, be a tangent that takes away from the point of our story. As I’ve written about before, our scenes need to include at least three reasons to exist, such as: plot points, character goals, character development, conflict, stakes, etc. Ensuring that we’re weaving different purposes into a scene is the reason behind my Elements of a Good Scene Checklist (and Worksheet). The Elements of a Scene Checklist is meant to help us identify when a scene isn’t pulling its weight for the story. When we spend a lot of words on unimportant things, we drag the pacing of our story down, and a scene that’s only an info dump will make our story stop dead in its tracks. The next level of weaving is making sure that we don’t have paragraph after paragraph of the same element in a row. Action, description, exposition, dialogue, internalization, etc. should all be used but not overused. I often think in terms of a Two-Paragraph Guideline. We can switch between action, exposition, dialogue, internalization, etc. every two paragraphs (or so) to prevent reader boredom, pacing issues, and choppiness. We’ve heard that readers can follow three paragraphs of unattributed dialogue (assuming there are only two speakers), but after that, readers need a descriptive dialogue tag or an action beat to ground them in the scene again. On the other end, setting description can get boring after one paragraph. So two paragraphs of any one writing element in a row is a good guideline. If we need more than two paragraphs of introspection, we might look at how we can mix in action. Is the character doing something while they’re thinking? Even better, can we make the action add to the scene by creating conflict or showing subtext? Maybe a wife is thinking about leaving her husband while she’s folding laundry. Does she discover a lipstick stain on his shirt, and she decides that’s the last straw? Or does she take care in folding his clothes “just so” to prevent wrinkles, showing that she still cares about him? At the sentence level, we can break information into sentences, or even just phrases, that are woven with other elements. These short insertions allow us to share information with a reader without calling attention to it. Much of writing is about creating layers, and that’s what weaving is all about. We don’t have to paint the full picture of our settings, worldbuilding, or a character’s backstory (or any other potentially tricky element) all in one go. For backstory, in chapter one, we might mention that the hero has a bad relationship with his father in a single sentence or phrase. In chapter three, we might reveal the detail about how long it’s been since they’ve spoken. In chapter eight, we might share the words of their last fight. Etc., etc. Similarly for setting, at the start of every scene, we need to anchor readers within the setting. However, that doesn’t mean we should open every scene or chapter with a paragraph of setting description. Instead, we can include a phrase here and there. In the same way, our world-building can be constructed one phrase or sentence at a time. Over time, they’ll give readers an impression of our world. Jewelry trickled through Elaina’s fingers, scattering reflections across the peeling linoleum of her bathroom floor. Each piece hinted at how she’d acquired it for her collection—a broken clasp on a silver chain, earrings missing their backs, a loose sapphire she’d rescued from a sink drain. But the precious ornaments lacked the satisfying clink of gold coins when they landed in the safe-box at her knees. Humans didn’t make treasure like they used to. Such a shame. Setting: Just two phrases—”peeling linoleum of her bathroom floor” and “they landed in the safe-box at her knees”—are enough for readers to visualize the scene. We see that she’s in a bathroom, that her bathroom is low-end (peeling linoleum), and that she’s kneeling in front of a safe-box of her treasure collection. Backstory: We get that there’s something different about this character. Who is she that her linoleum is peeling, that her jewelry collection is made up of broken pieces (and she’s not bothered by that fact), and that she finds the clink of gold coins satisfying? Worldbuilding: We understand from one short sentence—”Humans didn’t make treasure like they used to”—that she’s not human. Readers might also pick up on the subtext of how she values jewelry that humans wouldn’t, thinks gold coins are superior, and finds it a shame that humans’ concept of treasure has changed. If readers start thinking “dragon,” they also get the world-building hint that this dragon has fingers. Ahh. A shapeshifting dragon. That’s a ton of information shared in four and a half sentences. Yet none of it interrupts the story flow, feels irrelevant, out of character, or outright told as an authorial interruption. Readers don’t mind backstory (even flashbacks), or anything else that could potentially hit that pause button, if the story flows and moves forward. That’s the key for including backstory, worldbuilding, or anything else in our story. Backstory has a bad reputation because it’s often used so poorly. Writers include big chunks of information before a reader needs it (or is even curious about it), and the chunks don’t feel like they fit the story, character, voice, or point of view. Avoiding problems requires us to include information in a smart what, when, and how way. We should share necessary information only when the reader needs it in a way that fits the story (and scene, paragraph, sentence, voice, point of view, character, etc.). Relevant information doesn’t interrupt the story’s pace. Timely information fits current events and keep the story’s flow. Shown information feels active and true to the character. Weaving information in layers gives readers what they need to know without dumping information all at once. weave information over layers of scenes, paragraphs, and sentences. Have you read stories with too much info dumping of backstory, setting, worldbuilding, or other element? How could the authors have fixed the problem? Do you struggle with info dumps? What type of information is hardest for you to weave within a story? Does this post help, or do you have other questions? And you’re absolutely right that genre and style can make a big difference in how we balance the elements we weave together. 🙂 Thanks for the comment! I’m trying to be aware of info dumps. My WIP does have a lot of important backstory that I’m attempting to convey without actually saying it. When my MC was a child, she survived a car accident that killed her parents which is pivotal to her state of mind now. I’ve been introducing it bit by bit into the first chapter, first off by describing a large scar on her face, then by her telling her friend that she was going to visit her parents and starting the next scene in the cemetery. I’ve described their grave as being one that she narrowly avoided so we get an idea of what happened. The specific detail of there having been a car accident comes up as part of a conversation a couple of chapters later. Oh, good examples! I like the visit/cemetery snippets you mentioned–very powerful way to show the past. Thanks for sharing! This is an excellent review of the subject. I’ve beta read pieces before where nothing’s really wrong, but it lacks enough context to made the character’s actions relevant. A liberal balance is indeed the best way forward. I never heard it articulated quite like this, though, so thanks for sharing. Oh yes, context is tricky. We know what we mean, so it can be hard to see where we need to fill in. 🙂 Thanks for chiming in! Yay! I hope it helps. 🙂 Thanks for giving me the post idea! LOL! Well, said. 🙂 Thanks for the comment! Another informative article. I was working on this exact concept in my WIP. I appreciate how you share both what is helpful and NOT helpful with the information sharing. Timing is the hardest part, as in figuring out how much to tell and when. This is going to take some practice to learn, but this was helpful. Yes, definitely practice–and also knowledge that we can fix things better in revisions, after we know the full scope of the story. 🙂 Thanks for the comment! I’ve read and downloaded your sheets for improving scenes so I’m ready for that. However, the information on paragraph level and sentence level aspects in relationship to info. dumping I hadn’t really considered consciously before. This is good info., Jami. Thank you. I’ll be filing it with other posts I’ve kept from your blog. I constantly learn and improve with these concepts all the time too. 🙂 Getting the balance right usually doesn’t happen until revisions. LOL! Thanks for the comment! As far as leading participle phrases, some authors get so big that editors stop pushing them to improve or even to not rest on their laurels. Plus, I’ve seen a real drop-off in the quality and amount of editing some traditional publishers do. *shrug* I obviously don’t know if that’s the case here, but I’m no longer surprised by poor quality. :/ Thanks for stopping by! Love all your tips! Great stuff. (2) Thinking in terms of deep POV. If my character wouldn’t think it that way, I can’t say it. We don’t replay our backstories in our heads; rather, we reference tidbits here and there as they play into our current situation. I remind myself constantly to stay in the main character’s head — which helps me avoid those info dumps. Agreed completely about first drafts and critique partners (beta readers and editors too! 🙂 ). I never get the balance right the first time out, and often not the second time either. LOL! Oh yes, love how you point out that just as we don’t think about our backstory all the time, our characters wouldn’t either. As you said, that’s where a deep POV approach can help so much. 🙂 Thanks for sharing your insights! Fab tips to keep in mind. We can all stray so easily into the minefield of info dumps and only recognise it on a later read through. Sometimes we’re so wedded to the paragraph(s) we don’t even recognise them as info dumps until much later. I had a couple of examples of this in my latest work. One I realised on my own, another a beta reader pointed out to me (shudders that it had got that far!). Anyway I stripped them down to the bare essentials and then built the crucial information back in – weaving is a great way of putting it. The story was leaner and worked so much better. All the information stripped out wasn’t missed because the essence was still there. It’s an important lesson to learn. Thanks for covering this so thoroughly. Yes, in my current WIP, I have to include some explanation that my character wouldn’t think about quite that way because she knows it already. I did my best to cut it to the bare minimum (a paragraph), weave in other things to make the section work harder, and keep it in her voice. We’ll see if that passes muster with my editors. 😉 Thanks for sharing your experiences! Thanks so much for this article! Totally agree that backstory is not evil–it just needs to be tied in to whatever it is the Author is trying to say with their story. Great tips on weaving elements too–shown information over told information. Yes!